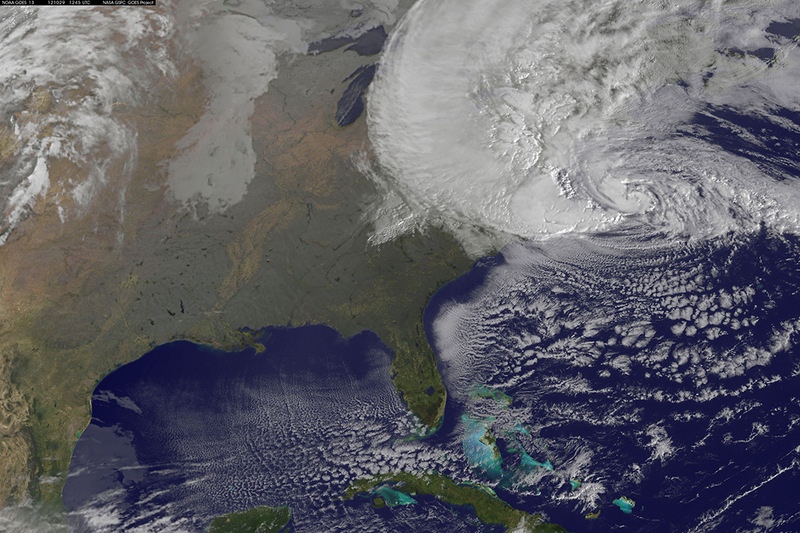 Hurricane Sandy moves along the East Coast. Tourist locations are hardest hit during natural disasters, but also provide significant, and often unheralded, resources during recovery efforts. A research group at Rochester Institute of Technology is measuring those efforts and the value of the contributions hotel and lodging sector personnel and facilities provide during times of crisis, beyond basic shelter. The research effort combines two distinct groups from the university with expertise in both hospitality and disaster recovery—to collect information that could influence the industry in how it produces broader guidelines and assistance plans for disaster response and recovery. According to Moody’s Analytics, Hurricanes Irma and Harvey caused between $150-$200 billion in property damage in Texas and Florida. Both areas rely on tourism as an economic driver, and both have high rates of destructive, weather-related events. Hotels have contingency plans when severe weather storms through a region. Staff are trained in procedures to ready hotels for impending storms and to protect personnel, guests and property. While the economic impact of the hotel and lodging industry is well-documented, what is less understood is the value the industry provides local communities during and after major disasters. The RIT researchers are developing a tool to assess the financial value of lodging resources provided for recovery efforts through a one-year, $45,000 grant provided by American Hotel and Lodging Educational Foundation. Data will be collected from multiple sources, including regional and national restaurant and lodging associations, as well as through surveys, interviews and focus group sessions with general managers of tourist destinations in the target areas. Analyzing data from these resources will be the baseline for metrics to determine valuation of time and resources for non-financial contributions, Lagiewski explained. Lagiewski is leading the research project with Muhammet Kesgin, assistant professor in the Department of Hospitality and Tourism Management. They will be joined by Jennifer Schneider, Eugene H. Fram Chair in Applied Critical Thinking and principal, for the Collaboratory for Resiliency and Recovery. This latter group helps provide integrated information about incident response capabilities to ensure communities can be prepared in the event of catastrophic events and emergencies. RIT’s research began in September and will continue until June 2019. Both the hospitality and resiliency programs have numerous alumni in U.S tourist destinations such as central and the southernmost tip of Florida—regions that experience hurricanes and tropical storms annually. Note: Through an internal CONNECT grant, sponsored by Advance RIT and the Office of the Provost, an extensive literature review was conducted from 2016-2017 on Disaster Science: Management and recovery in hospitality and tourism. The work was incorporated into a paper, “Critical Hospitality: Metrics as a path to resort resilience,” authored by Sarah Dobie, an RIT graduate student and research project team member, which was presented at the International Symposium on Sustainable Systems and Technology Conference (June 2018).